CHICAGO, March 30, 2017 /PRNewswire/ -- CNA today announced its participation in Distracted Driving Awareness month with an education campaign to promote safe driving behaviors. Distracted driving has joined alcohol and speeding as a leading factor in fatal and serious injury crashes, according to the National Safety Council, and cell phone use is involved in more than a quarter of all vehicle crashes. "Distracted driving poses significant risk to every business that has employees who drive both company-owned and personal vehicles for company business," said Steve Hernandez, Senior Vice President, Risk Control, CNA Commercial. "To reduce deaths and injuries associated with distracted driving, CNA's experts are using their knowledge and experience to help our customers better manage their exposures." Companies and individuals with company-owned and personal vehicles that are used for company business can learn strategies that manage driving behavior by joining CNA and Focus Driven, a nonprofit that raises awareness around distracted driving, at a complimentary webinar April 11 at 12 p.m. CT. The webinar, "Distracted Driving — Impact on Employee Safety, Productivity and Employer Liability," will also detail trends that can impact safety. Register for the webinar at www.cna.com/riskcontrol. Similarly to driving while intoxicated, using a cell phone while driving unnecessarily puts the driver and others at risk of injury - or even death. CNA's Rob Beneze, Risk Control Consulting Director, writes about how distracted driving soon could be treated the same as drunk driving with the Textalyzer, a new device that is the digital equivalent of the Breathalyzer. This new technology could determine whether a driver had used the phone to text, email or any other action that is forbidden under hands-free driving laws immediately prior to an accident. 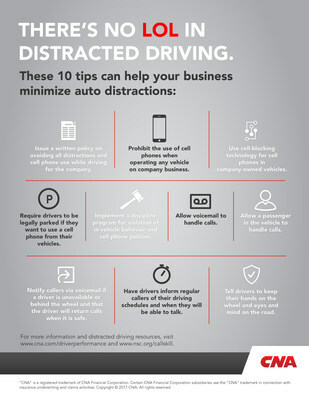 Issue a written policy on avoiding all distractions and cell phone use while driving for the company. Prohibit the use of cell phones when operating any vehicle on company business. Use cell-blocking technology for cell phones in company-owned vehicles. Require drivers to be legally parked if they want to use a cell phone from their vehicles. Implement a discipline program for violation of in-vehicle behavior and cell phone policies. Allow voicemail to handle calls. Allow a passenger in the vehicle to handle calls. Notify callers via voicemail if a driver is unavailable or behind the wheel and that the driver will return calls when it is safe. Have drivers inform regular callers of their driving schedules and when they will be able to talk. Tell drivers to keep their hands on the wheel and eyes and mind on the road. Additional information on distracted driving resources can be found at www.cna.com/driverperformance or www.nsc.org/callskill.